Timilia (also known by various names in local dialect, such as tumminia, timminia, trimminia) was cultivated during Greek times and called trimenaios, meaning wheat with a threemonth growth cycle. It is an ancient variety of durum wheat with a short lifespan (it ears up to about 180 cm) which is quite resistant to drought and thrives on little water. Milled on ancient stone grinders, it has a low gluten index, making it very easy to digest. Goethe describes it as “a precious gift from Ceres, at the beginning it sprouts a delicate little leaf, then it grows into wheat and becomes very strong and sturdy”. Symbol of the succulent Sicilian culinary tradition, busiate is a pasta-shaped form with thin tubes twisted on itself, a sort of macaroni. The name would be referable to the "buso", a particular knitting needle that was usually used to work fabrics such as wool and cotton. But the term could also refer to the busa, or the "disa", a graminacea typical of the Mediterranean that the farmers used in ancient times to tie the bundles of spikes. 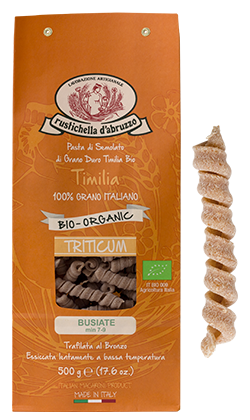 The Rustichella d'Abruzzo busiate are made with timilia, one of the ancient wheat varieties that Rustichella proposes to recover to offer a healthier perspective of being at the table. They can be served with tomato sauce and fish sauces. The name originates from the dialectal form "i zit" (the spouses). In fact according to the culinary tradition of southern Italy the ziti are the pasta of solemn occasions, in particular of the wedding dinner. Unlike long ziti, to be broken by hand, this format is already broken and ready for cooking. 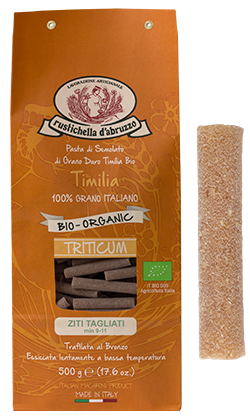 They are produced with the timilia, one of the ancient wheat varieties that Rustichella proposes to rediscover for a healthy and genuine eating philosophy. Ideal with the cream of Rustichella d'Abruzzo basil or with a light dressing based on vegetables.